One of the premier exclusive resort communities in the state, Flying Horse features luxury homes amidst a grand mountain setting. While there are homes here that list in the multi-millions, the average price for homes here is in the mid 500's. These homes are on large, very well manicured lots and some of the newest, most spectacular modern features in the new home market. The centerpiece of Flying Horse is, of course, the very exclusive Club at Flying Horse, which features a private 18-hole Tom Weiskopf Signature Golf Course, European resort-style Golf Clubhouse, and a World-class Athletic Club and Spa. In addition to golf, the club also offers aquatics, spa services, private dining, fitness training, Tennis, gymnasium, family and fine dining, meeting facilities and a wine tower. Voyager Pkwy runs to the west of Flying Horse, and provides easy access to some of the area’s newest restaurants and shopping areas, including the upscale Promenade Shops at Briargate. Interquest Pkwy to the south provides access to an IMAX theater and several restaurants, as well as very easy access to I-25 and Downtown Colorado Springs. Northgate road is an easy way onto the Air Force Academy and Falcon Stadium for exciting college football games. 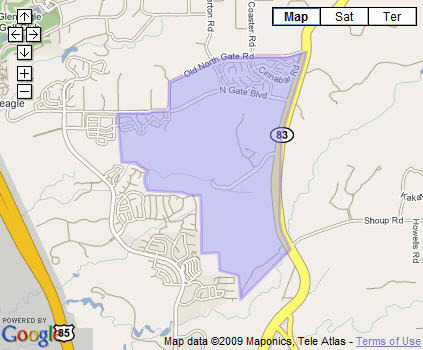 Air Academy District 20 serves the Flying Horse neighborhood. D20 is well known as one of the best districts in the state, consistently scoring high in most academic categories, and has one of the best graduation rates in the state. Students here attend the Discovery Canyon Campus which accommodates students from K-12 and brings students together in a content rich, integrated study program. The Classical Academy is also here, as is the Rampart Range Campus of Pikes Peak Community College. Flying Horse offers residents beautiful homes, some of the area’s best shopping, dining, entertainment and golf, as well as excellent schools and easy access to the Air Force Academy. These are just a few reasons that Flying Horse is a great place to own a home.